Aggregate Operators Fined $33,000 for Unlicensed Quarries. Two proprietors and a company were fined a total of $33,000 for operating a quarry without a licence under the Aggregate Resources Act. Gary Nichols and Nichols Gravel Limited of Delhi were each fined $15,000. William Monture, proprietor of Aboriginal Imports Quarry, was assessed a penalty of $3,000. 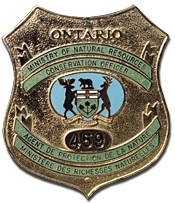 A lengthy investigation carried out by Ministry of Natural Resources conservation officers determined that Nichols Gravel and Aboriginal Imports Quarry were operating a quarry in the Hagersville area without a licence. Justice of the Peace Paul MacPhail heard the case in the Ontario Court of Justice, Cayuga, on April 30, 2013 and rendered his decision on July 31, 2013. The Ministry of Natural Resources reminds residents that operating a pit or quarry is illegal except when licensed by the province. ← Tourism Operator to Pay $2,500 in Fines and Fees.